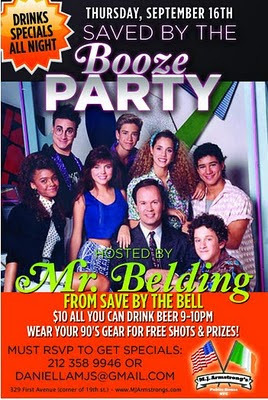 Tonight, MJ Armstrong's (329 1st Avenue) is hosting a Saved By The Bell Booze Party! According to the bar's website, Mr. Belding himself will be there! There will be an AC Slater and Zach Morris look alike contest and specials include $10 all you can drink beer from 9PM-10PM followed by half priced drinks. RSVP to daniellamjs@gmail.com and let us know how it is!